Hosley's Set of 2, 9.5" High, Clear Glass Pillar / Votive Candle Holder with Hurricane Rope Wrap. Ideal Gift for Weddings, House Warming, Home Office, Spa, Votive / Pillar Candle Garden. 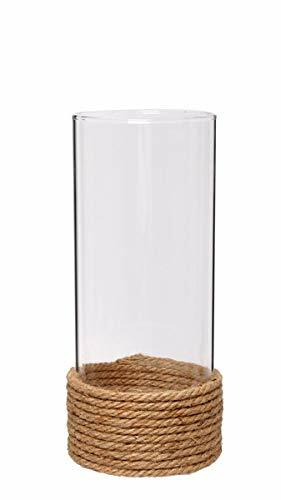 PRODUCT: Hosley's Set of 2, 9.5" High, Clear Glass Pillar / Votive Candle Holder with Hurricane Rope Wrap. USES: This is a great addition to a Pillar or Votive Candle and can be used with our own Hosley's highly fragranced candles. The Holder is the right gift for a wedding and can be used for a party, reiki, spa. MEASUREMENTS/MATERIAL: Each one measures 4.3" x 4.3" x 9.6", and made of glass.